You might think you got your girl a nice sized rock when you popped the question, some gas giant at the edge of the solar system just blew the curve for the rest of us guys. Plenty of chatter today about games. Too much, even. Let's take a break with some officially sanctioned off-topic discussion. To provoke it, here are some idle thoughts with 19 shopping days left until the Super Bowl. 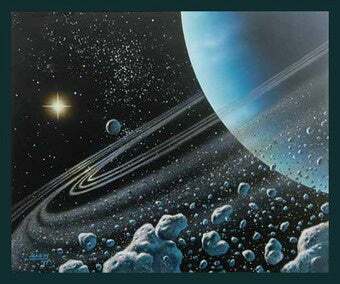 Diamonds in Uranus? - Maybe, and they'd really, really big ones, actually. Like oceans of liquid diamond with iceberg sized hunks. In other news, Saturn is a planet of ice cream with cotton-candy clouds and jellybean mountains. Onward Christian Soldiers - Military sniper rifle sights made by a Michigan company with a $660 million contract come inscribed with references to Bible verses, free of charge. The company's marketing director is all "What's the dif?" and complains that the issue is being raised by groups that are "not Christian." Two Strikes, Yer Out - A former U.S. major leaguer who brained a minor league catcher with a bat a couple years back has been banned for life by the Dominican Republic's baseball league after slugging an ump. More intriguing, the U.S. umpires working the league all quit in solidarity and left the nation.